As well as offering the full range of neighbourhood pharmacy services and products the Tower Bridge Wellness Pharmacy provides the very latest in medical wellness testing, personal discussion of results and consultative advice on maintaining, improving or returning to health lifestyle strategies. The wellness marketing literature we have developed for Tower Bridge Wellness Pharmacy, including a comprehensive 48 A4 page brochure provides an in depth and informative source of information on not only offerings like Functional Medicine, in which the pharmacist is qualified, but also how to benefit from a DNA testing-informed approach to personalised healthcare. 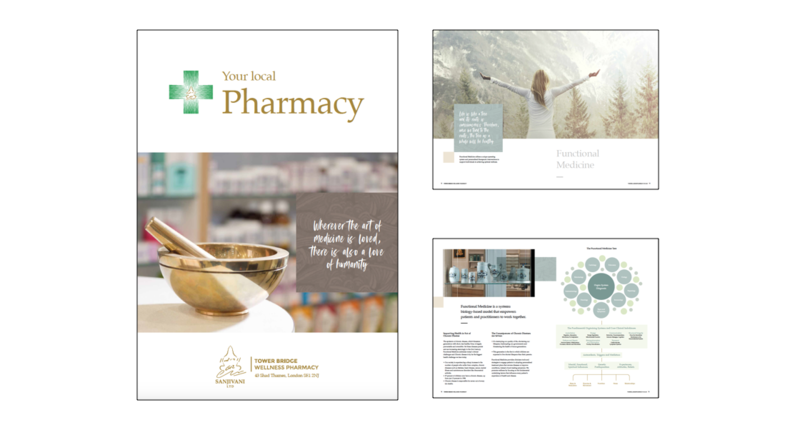 In addition to the main brochure, where the proprietor’s enlightened approach to medicine and wellbeing is fully showcased, we have summarised the proposition in both a 12 page A5 mini-guide and a brief 4pp A5 overview leaflet. We look forward to supporting Tower Bridge Wellness Pharmacy further as this dynamic start-up innovative business has ambitious plans for growth. Alongside what you would expect from a regular pharmacy the complementary personalised medicine services on offer really do set the company apart and represent the future of healthcare. View the Tower Bridge Wellness Pharmacy brochure here. View more examples from our healthcare portfolio, including further London wellness marketing projects. For more information about how we can support your London wellness marketing requirements, please contact Frank Norman our Client Services Director on 01784 410380 or email.